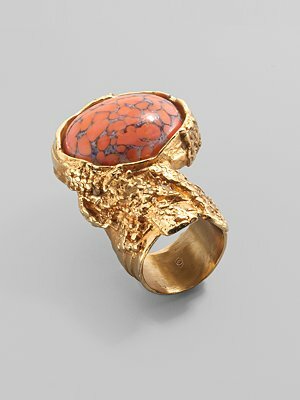 I am completely enamored with YSL's ever popular bauble, the Arty Ovale Ring. Seen in countless magazines and on the fingers of fashion-forward bloggers, I can't help but admire its beauty and stamp it firmly on my wishlist. I wouldn't dare ask for one; No readers, this will be a treat to myself in the future. As long as I can track one down. I love them all, but I am gravitating towards the oceanic blue lapis or the turquoise. I'm sure the final decision won't be an easy one. 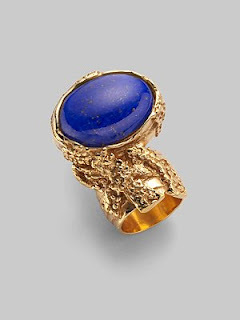 Candy-colored stones set against regal gold. And talk about statement jewelry! I think if you're in the mood to splurge on something special, the Arty ring is the way to go. Absolutely great blog, I absolutely must have him on my list. Just come and rate my blog. I love this too! Maybe someday---I like the last two, the blue and the turquoise best. I love this ring too although I have heard mixed reviews on it...like the stone was not placed correctly. But I def. wouldn't mind having the last one! i have two arty rings..both gifts from my hubb. they are really really gorgeous and definitely worth every penny! Kaleido Mind: Coral would be so gorgeous for Spring and Summer! Ness, Mere, Katie, and V: Blue is the vote amongst you girls, and I agree. I just love the lapis the most I think because it's such a fun bright color. Since I wear a lot of neutrals...that color would be a pop! Of course I want them all. Frankie hearts fashion: Me too, such a stunning color! Cynthia: I know, the blues are my favorite. Marie: Have a great weekend too! 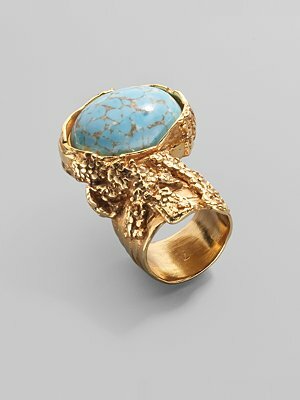 Natasha: It does look interesting, much more so than the turquoise ring I currently have.